The day that Ben came to set up his show at the gallery with Carol Emerson and I it was hot and humid–one of those days where the air conditioner seems to be heaving to catch it’s breath as it tries to lift the heavy humidity out of the dense air. Thankfully the AC got the upper hand and the lifting and holding of Ben’s large paintings, as we placed them, viewed them and finally hung them, was bearable. And something else seemed to cool the room despite our labors. The blues and greens and earthy grays and browns of his paintings brought us to a quiet and shaded spot protected from the heat. We were beside waterfalls , abstract foaming waves, or in the shade beside a stream in the woods–we happily found ourselves surrounded by water. We joked that he was probably hot when he chose the paintings to bring to the show. Ben described to us his attempt to work in his studio the day before–a studio armed with only a fan to fight the heat, which lost the battle. Ben packed up his painting supplies and left his home in inner city Philadelphia for the park along Wissahickon Creek. He walked in the creek and placed stones to create a place to sit where most of his body was submerged. He then created a shelf before him to serve as a table so that he could paint. He laughed, explaining that he was no longer hot. His arrangement was, however, imperfect and his work managed to get wet, but this was no bother to him because Ben does not paint only what he sees–he paints what he experiences, imagines and what he synthesizes with other natural settings where he has been. The places he paints don’t exist per se, but I would say they are real–because the viewer recognizes, through the abstraction, experiences and impressions of the creeks they have waded through or the beaches they have visited. When in nature, Ben explained, he observes, sketches or takes a photo. In his studio the synthesis of the real and imagined happens as he paints. Isn’t this, in a sense, what we all do? We synthesis our imaginations , memories, experiences and knowledge when we are at our best. The real is enhanced by imagination because it becomes adaptive to the present moment and to future possibilities as opposed calcifying. Ben describes his work as organic. “The subjects of inspiration are starting points for something that will become much more intensified, as I reinterpret how I see the world we live in,” he explains. “I view nature as a macro reservoir of an infinite number of subjects that can be explored and rendered. These organic forms can be altered and recreated, made abstract while still remaining recognizable to their original subject. ” To find out about Ben’s First Friday July 6th show and see another of his paintings visit the Painted Desert Galley. I have been reading a little book of essays by writers who are Catholic. In Signatures of Grace: Catholic Writers on the Sacraments each writer was commissioned to write about one sacrament while including personal experience and the history of the sacrament as context. Author Patricia Hampl wrote the essay “Penance”. In reflecting on the history of Penance, Hampl draws our attention the communal nature of the sacrament in the early church and its essential communal function for all time. “It is strange”, she mused, “that the sacrament of Penance should be so thoroughly associated with privacy, even secrecy.” This is certainly the experience of many baby boom Catholics christened with pre- Vatican II sensibilities (many of who have never darkened the door of a confessional in their adult life.) The fear and shame of our own sins told to God as represented by our parish priest were mercifully covered with a prescribed privacy. This was followed by the relief in stepping out of the ordeal with a child-like joy at being made anew. The prelude of fear and shame have been transformed into awe and humility, the most basic religious dispositions. It is here in her essay that Hampl refers to therapy, with its modern orientation toward the individual, as a counterpoint to Penance with its ancient orientation to the community and the importance of the individual to the whole. “The joy in finding the repentant sinner is not the kind of satisfaction to be found in the therapist’s office, where the lost and scattered shards of a life are excavated and carefully pieced together to form the essential thing: a life worth living bred of a life story worth telling. “Penance”, she continues, “was intended to heal a different wound- not the break between a person and individual consciousness (or a personal past), but that between the self and the community, which for the ancient, was the core of existence”. To really understand another’s religious experience or world view we must understand how their disposition is shaped by the forms they have inherited. In the case of a Catholic, the sacrament of Penance holds the memory of a time when to not be part of the tribe was to die. Nomads, in the arid wilderness, living a fragile tightrope between survival and death, could easily be shattered by the selfishness of one of its members. Fear of separation, guilt for failed duties and shame for putting self before the group were necessary and adaptive attitudes of survival. Superficial pop-psychology portray fear, shame and guilt as enemies of self-actualization imposed on the individual by conventional society. But in the context of a loving community they are the cornerstone of the most beautiful aspects of religious sensibilities. Fear, shame and guilt play, in ones family and communal life, the same role that pain plays in ones bodily experience, as a warning signal that something wrong needs to be made right. Fear, then, becomes awe, shame becomes humility and guilt becomes the impetus for reconciliation and restoration of ones place as a contributor to the welfare of the community. To be communal is also to communicate something important between the individual and the community- that is, it is insufficient to be contrite, confess to God and oneself internally as part of healing because it is incomplete if one is not reconciled to the community. The communal aspect may not be so obvious in the actions- the actual confession may be an quiet encounter between penitent and priest- but the act of “going to confession” is communal and is expressed in many churches in communal penance services particularly offered during Advent and Lent- times set apart in the seasons of the church for prayer, fasting and almsgiving. As Hampl tells her own story the reader finds that she like many of her Catholic peers had left the Sacrament behind- in her case for thirty years. She ends with her experience of the Sacrament in it’s post-Vatican II form while on a silent retreat at a monastery. In her experience of what is now called the Sacrament of Reconciliation, she spoke face to face with an elderly priest. So modern in its intimacy, where one can lower or raise ones eyes in shame or connection, the experience is still ancient with the priest representing Christ and the community with whom she reconciles and in a more “public” way then behind the screen. As she progresses toward this experience where “you don’t get to understand; you just get to acquiesce”, she becomes more disparaging of psychotherapy. In retrospect the 18 months of therapy she experienced, which she recounts with a touch of comedy, seems self-indulgent, and its self-understanding and reconciliation with the self. Contrasted with the acquiescence of the sacrament, the analysis of therapy was found wanting. Trying not to be defensive as psychotherapy took it on the chin, I wondered about her journey or in psychological terms, the course of her identity development. Was the casting about the “scattered shards” of her life to form a story, as she described her course of therapy, however incomplete, somehow a preliminary to her later spiritual and communal reconciliation? At ones mid-life there is an opportunity to look back on ones life from a potentially wiser perspective. Wisdom, however, is not gained through age and experience alone. It is gained through self and spiritual awareness often developed through falling apart and struggling to reform oneself. Yet, I and my fellow psychotherapists should take the hit. A little slap in the face is always an opportunity to shake free of the arrogance brought on by taking too seriously the value of ones profession. Here’s where I agree with Hampl’s critique: One will never, as it were, figure oneself out. And even as a psychotherapist who respects the role of guilt and shame in our interpersonal lives, I must perhaps take some responsibility for the overzealousness of psychology in its brash call to liberate clients from the tyranny of religious legalism. Religion, like any human enterprise, can go awry. Yet religion at its best points to what is best in us and what transcends us. Perhaps it is best in the end to acquiesce and stand “ shivering in the growing cold,” as did Hampl after the sacrament, “unable to make out the hinge of sea and sky, glad of that confusion, glad to give over to the mystery at last.” I, for myself, draw upon one of the fruits of my spiritual formation as a Catholic child: humility- freed now from excessive guilt and shame (with the help of psychotherapy.) As I accompany my clients among the shards it is not so much as a doctor or expert but as a humble companion with some experience. Humility is, in the end, an important disposition for the therapist as well as the client if there is to be healing and growth. How does religion come up in a therapy session? Sometimes religion enters psychotherapy the moment the client enters the room. This was the case with Nancy. Her bright face and warm smile changed to an urgency as she sat down. Leaning forward on the edge of the couch she clasped her hands and told me that she no longer knew how to pray. Her son had been an ex patriot in Mexico and his life had been threatened by a corrupt official. She had been in daily contact with him and the embassy arranging for immediate departure. She prayed for his safety as fervently as she pursued embassy officials and knew, from all her past experience with prayer, that he would arrive safely. When she was told of his murder, she sunk into grief and a crisis of faith: her prayer had not been answered despite her belief that it would be. The very faith that had sustained her in past losses was threatened. This left her bereft. Other times it enters in surprising ways by those who had never discussed experiences in anything but secular ways. Ann, an anthropologist, during an intense moment in telling her story in group therapy one night reached beneath her collar to pull a chain to reveal a medallion of the Virgin of Guadalupe. 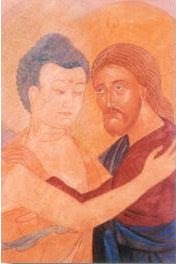 Ann had long since left her nominal Catholic faith and was drawn more to Buddhism , yet, she explained, the virgin had become her mother long after the death of her own manic depressive mother. Or the therapist may hear something in the client’s voice, cadence or metaphors that suggest something of faith. And with patience and gentleness the therapist without being intrusive may welcome the subtle spirit into the session. Hospitality and patient listening can provide the necessary sanctuary within which one’s faith will most likely be expressed.